In the original Dragon Ball series, Master Roshi (Kame-sennin) realizes that Goku turned into a rampaging ape due to the effects of the full moon, and comes up with a characteristically Dragon Ball solution—just blow the stupid thing up! After all, who needs it? After this, the moon is restored by the Dragon Balls, if I recall correctly. Later, Piccolo blows it up again to stop Gohan's rampage during their training. It's become sort of a stereotype of Dragon Ball that people are constantly blowing up the moon, and that sometimes when they do it, the moon has already been blown up and yet mysteriously reappears just to be blown up again. My question is, just how many times was the moon blown up? And how many of those instances were plot holes, if any? This forum thread makes some unsourced claims about the answer to this question. I wasn't exactly filled with confidence in its accuracy, though. Answers covering any of the available material (the manga, the Dragon Ball and Dragon Ball Z anime, the movies, and the Dragon Ball GT anime) are appreciated. The moon was destroyed twice and recreated twice. The first time, it was destroyed by Jackie Chun, by using a MAX Power Kamehameha in the 21st Tenkaichi Tournament. It was later recreated during Goku's training with Kami, after Kami removed Goku's tail. This was revealed during the 23rd World Martial Arts Tournament. It was then destroyed by Piccolo during his training with Gohan. 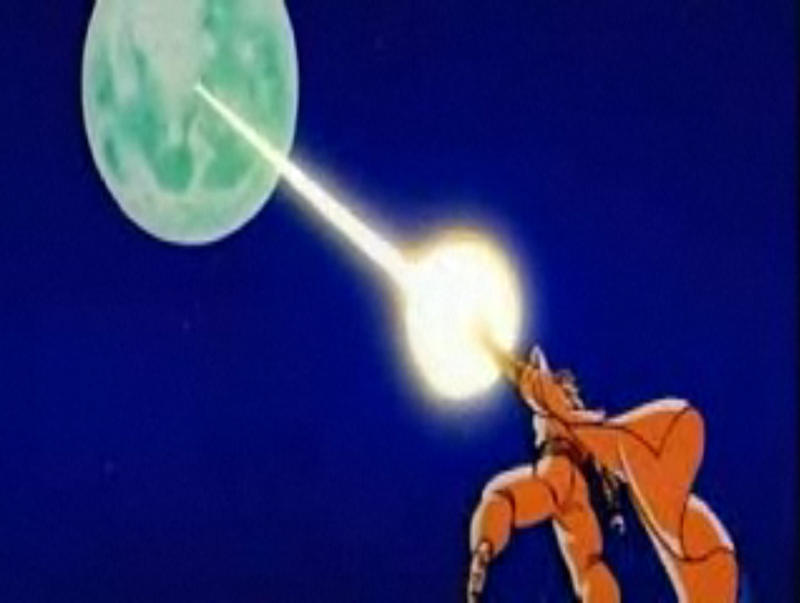 After this, the Earth's moon was never shown again until the Trunks Saga. The "one guy" mentioned here is Turles. And what he blew up was not the moon, but a Power Ball. He had created the Power Ball to make Gohan transform into his Great Ape form. He then destroys the Power Ball to prevent himself from turning into a Great Ape, as he claims that he would lose his wits if he does. and didnt it get destroyed in DBGT when Baby come to earth? the people present for the battle questioned where the moon was, including a brainwashed Bulma and Baby himself, giving an elusion to the moon whereabouts. This reminds me of Dragon Ball GT's inconsistencies. Nevertheless, the official number of times it was destroyed was 2. If I'm not mistaken, twice. As like you said, after the first time, the Dragon Balls were used to restore it. After the second time, I remember a time where Goku's spaceship (in which he came to earth) projected the moon so Gohan(?) could transform again, after which it was destroyed by Piccolo. That's the reason why Vegeta had to use a special technique to transform into a Great Ape in his fight with Goku. Finally, in GT, they had to use the earth as a "moon" during the fight with Baby, and a Blutz waves machine during the fight with Shenron. I can't remember any other time the moon was involved. So I think it was destroyed twice. How many of Dr Gero's Androids were actually Androids and how many were Cyborgs? Why don't Vegeta and Goku not getting along most of the times? How many characters in Dragon Ball can fire Kienzan-like discs?